Rashtrasant Tukdoji Maharaj Nagpur University (RTMNU) awarded degrees to 57,259 (two DLitt,769 PhDs, 12,878 postgraduates and 43,610 graduates) students during its 104th convocation ceremony. The convocation was held at the newly built Kavivarya Suresh Bhat Cultural Auditorium at Reshimbagh in Nagpur. Dr Anil Sahasrabudhe, who’s the Chairman All India Council for Technical Education, was the chief guest at the event. RTMNU presented 296 gold medals to 169 students, 100 silver medals and 100 prizes to 42 students. Sahil Dewani, who’s a law graduate from GH Raisoni Law School, was awarded with 20 medals. 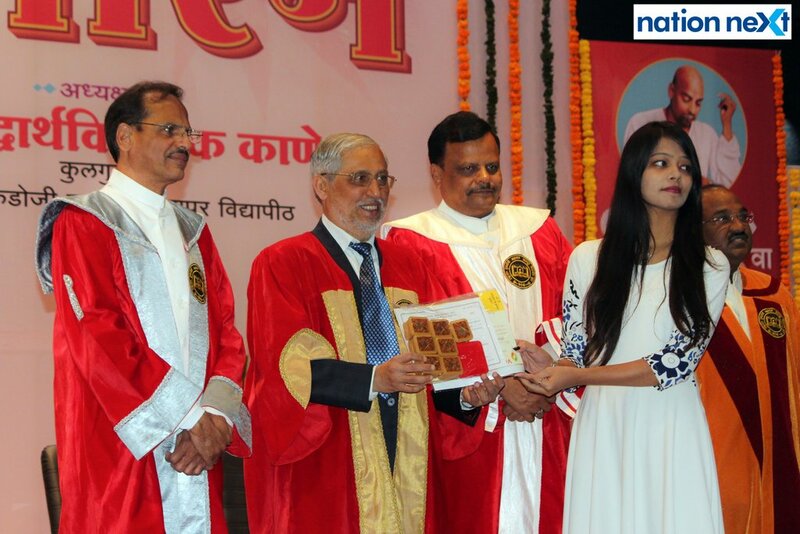 While BSc student Nisha Khotale from Dhote Bandhu Science College, Gondia, was awarded with 16 medals and prizes, Sheetal Wasnik of Dr Babasaheb Ambedkar Law College was awarded with 14 medals and prizes. Nisha Khotale, who wishes to pursue Masters in Physics, told Nation Next, “I’m on cloud nine! When I received a call from the university, I was surprised and elated!